Merry Christmas online slot gamers, Santa is here with a brand new bag of toys. Christmas slots are 10 a plenty these days but this one certainly does a good job of adding some sort of necessary value to the genre. Spin through festive and colourful reels of holly, snowmen wilds, and a slightly seedy looking Santa figure. Nevertheless, this game will have you bringing good tidings and cheer even in the warmest of months. Spin today to receive your Christmas bonus to play online slots now. Playson deliver high quality gaming solutions, in both digital and physical formats, to casinos all around the world and throughout the internet. Designing and developing their own titles from their home of Malta, Playson are a prominent identity in the industry, and regularly deliver exciting new titles to excitement hungry gamers, creating endless hours of fun for a clientele who keep coming back for all the great games that Wizardslots has to offer. 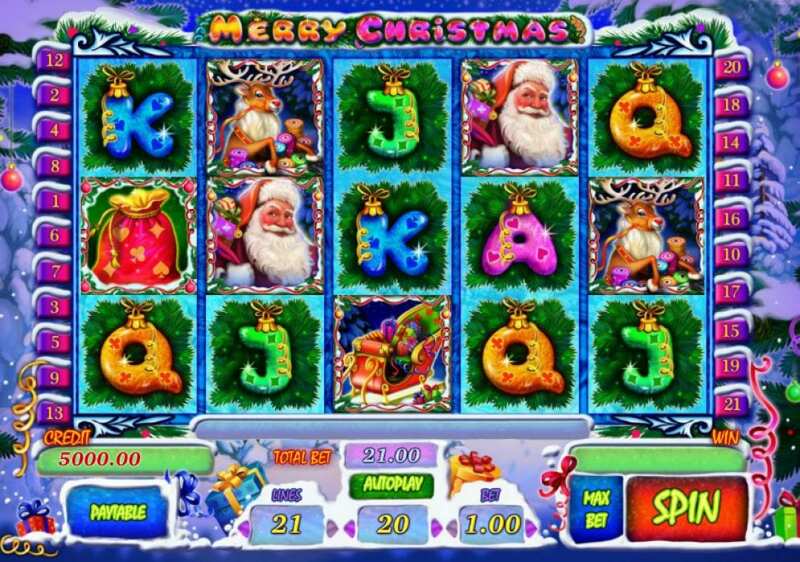 Merry Christmas is a 5 reel, 21 payline online slot that captures the festive essence of that most celebratory of seasons, packing it all into a delightful game of Christmas delights. With a soundtrack that will take you back to your favourite festive family films, and visuals that bring back that strange, cosy comfort of a crisp, snow-laden evening as the magical day draws ever nearer. However, with Playson’s latest festive delight, a little bit of Christmas – and a lot of festive rewards – can come to us at any time of day or night; season or holiday. With the mulled wine on the side certainly optional in this perennial Christmas-themed online slot, as soon as we start to spin, we get to see just how regularly Christmas can come for us. Our coins can be festively filled with anywhere between £0.01 and £0.25, with a minimum, stocking-filler bet of £0.15, all the way to a gift-wrapped £75.00. As Merry Christmas is a relatively simple game to get to wooly-gloved grips with, the regularity with which we spin is rewarded by frequent wins - each one lighting up the screen like a Christmas tree, and bringing with it a lovely chime of Santa’s sleigh bells. The symbols here are what you’d hope for in a Christmas-themed game – Snowmen, Reindeer, Stockings brimming with treats, and the jolly-old man himself – Santa Claus. Amongst a range of lesser-valuable Christmas baubles, in the shape of J through A cards, a festive hamper of fruit and champagne is the Wild here. Due to the relatively low number of symbols in the game, this Wild will lead to more regular wins. The only symbol it will not substitute for is the Grandfather Clock Scatter – 3 of which will land 15 Free Spins. The Free Spins feature is quite expansive, with up to 15 more on offer during the feature, during which Santa and his Sleigh will also become Wild. A Christmas Tree Bonus game can be activated with the Free Spins, during which you can raid the multipliers scattered around the tree to your heart’s content. The game will end when there are no more presents left – but, with Merry Christmas, this of course does not mean that the festive season is over! Far from it! !